Whether you want to go shirtless on the beach or want to wear a backless dress for a night out, bacne (back acne) can seriously put a damper on your confidence level. What’s worse, once it begins, it can be difficult to get your breakouts under control—bacne is one of the most stubborn types of acne! If you’ve struggled with breakouts on your back for a short or long time, this guide will walk you through the breaking the cycle of this tricky condition. We’ll help you regain your confidence and provide you with some safe and effective tips that will put you on the path to becoming back acne-free TODAY. Just like breakouts on other areas of your body, bacne can take the form of whiteheads, blackheads, or cysts. However, regardless of the type, many people find that their bacne breakouts are more severe and persistent than the ones that occur on the face. Bacne is caused by overactive sebaceous glands on the back and shares many treatment similarities as other forms of acne vulgaris. Surprisingly, our backs have an abundance of pores that can become clogged and are difficult to reach and therefore difficult to clean. It is important that you reach the location of the breakouts to cleanse your skin properly. If you are unable to reach your entire back, use a soft scrub brush with a long handle that can be used in the shower. Be sure to replace it every 4-6 months or earlier if it starts to look moldy or dirty. Shower regularly, especially after exercise or outdoor activities and always use a clean towel to dry your skin - used towels harbor dirt, debris, and acne-causing bacteria. It’s also important to keep your sheets clean, as these create some of the same problems as towels. We recommend changing them at least once a week. Use a mild cleanser when bathing and avoid “over rubbing” your skin which may stimulate your sebaceous glands to produce more, not less, sebum. Also, think about starting an exfoliation regimen on your body. While too much exfoliating can damage the sensitive skin on your face, your back is more “durable” and can withstand exfoliating treatments more frequently. Additionally, since your back can be difficult to clean, you’ll actually need this extra cleansing to keep dead skin cells and other debris from building up and clogging your pores. Bacne problems are exacerbated by clothing, especially tight-fitting clothing. This often causes sweating, which in turn clogs your pores and provides a warm, moist environment where acne-causing bacteria thrives. This problem is even more troublesome during exercise, since you are more prone to sweating. The solution to this is to shower after workouts and try to avoid tight-fitting clothes that are snug on your back. Certain hair and body products may increase your chances of developing bacne. Many body washes and sprays contain ingredients that have a harsh, irritating effect on your skin. In many cases, they may actually clog your pores—even though they’re designed to keep you clean! To avoid this, choose products with natural ingredients as opposed to synthetic chemicals and find a body wash that is labeled as non-comedogenic—which means it’s specifically designed to not clog your pores. If you sweat during the day, you may find that your hair products begin to run down your neck to the upper portions of your back. While this is a gradual process, the results will begin to build up over time, especially if you haven’t been cleansing those hard to reach areas. Therefore, try to select non-comedogenic hair products as well. Like other forms of acne, bacne is largely influenced by hormones. When too many “free form” androgens (aka testosterone) circulate in the bloodstream, this can have an influence on the skin and may increase your body’s production of skin oil (sebum). This process can lead to persistent pore clogging, and therefore persistent acne. While androgens are typically thought of as a “male” hormone, women also produce them, albeit in smaller quantities—which means that hormonal acne is a risk for men and women. It makes sense then that acne is an internal issue, which manifests itself externally, correct? So why wouldn’t you treat it at its core, internally? All of the advice we have given will help in the process of treating your acne, but alone, it will not eliminate your acne. The only thing that has the power to do that is a TREATMENT, and again, an internal treatment. 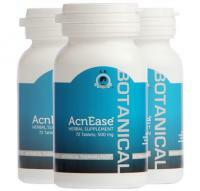 AcnEase® is one of the most powerful natural treatments on the market today that doesn’t directly alter your androgen levels, yet helps moderate their effect on your body’s production of sebum in a way that is natural and gentle, yet highly effective. It stops acne where it starts and addresses the problem from the inside out instead of temporarily relieving symptoms. How many times have you had to avoid doing things because you don’t want anyone to see your bare skin? Or maybe you go out exposing your back breakouts but feel horrible inside. Tell us in the comments – we’re here to help you experience your best acne-free life yet.